This is my first ever project and its been going great so far. 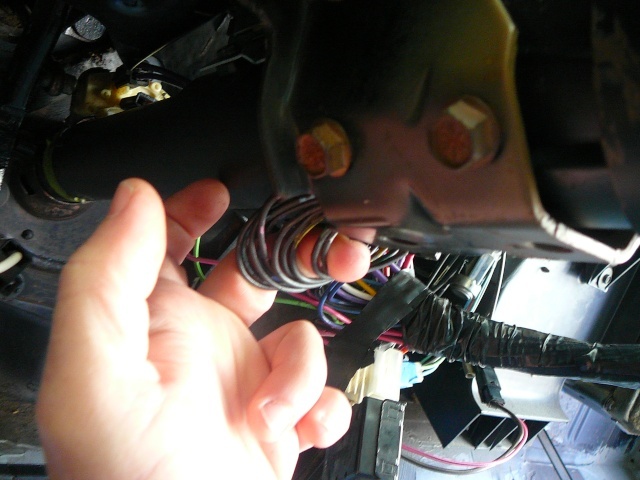 I reached a snag after I installed a steering column; I cant seem to figure out which wires attach to the column. I have installed a new battery and when I connect the positive cable the wipers and lights will work, but the ignition will not turn over. Lastly, where is the starter for '77 Malibu located? Any help would be greatly appreciated! Starter located back of the engine on the passenger side below the exhuast. Make sure you have wire loom with big red and purple wires pusher all the way together. Hope that helps. Oh and by the way welcome aboard! 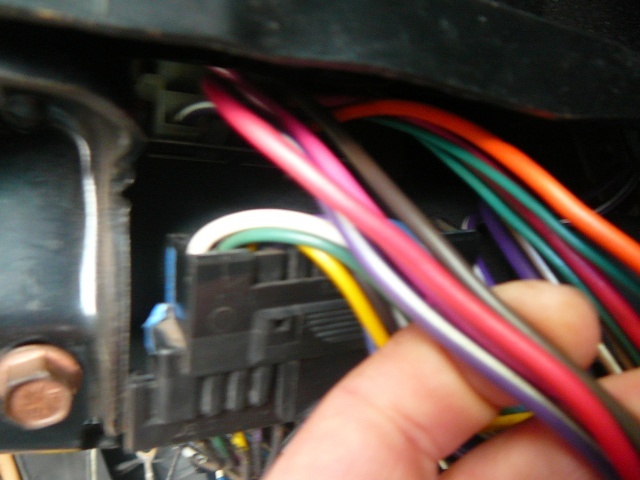 The loom has connectors which plug into the column and ignition switch. If you have all those plugged into the correct location, there is also a neutral / park safety switch which won't allow the car to start unless in one of those gears. This one is underneath the column support and is screwd in by 2 small screws. You can't see it in the pic but should be easy to deduce. Make sure that you slide the metal rod into the little hole in the unit. This connects to the other side of the column (see 2nd pic) they snap together and then clips into the column. Well? Did it turn over? OK, I need help. Figured I'd keep this old thread going also for other 77 Malibu related wiring issues. I have a battery that is charged (I think anyway). Starter is wired & I have 12Volts there on the + side & - side to also run a Voltmeter. Also, 12 Volts at the Alternator. 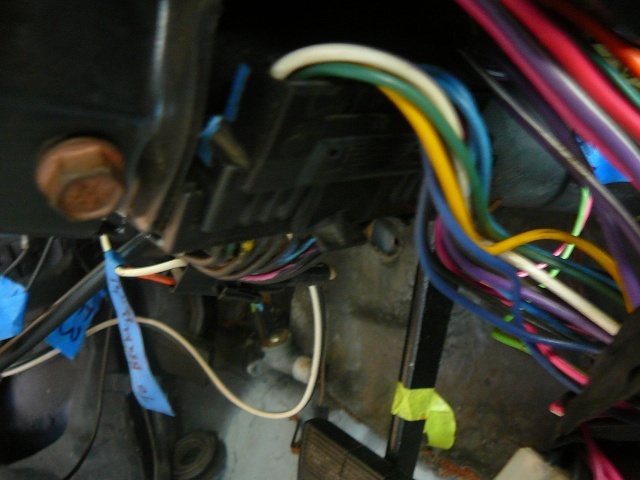 I have my engine harness plugged into the fuse box & the column is wired like described above when I posted that info for another member. No power @ the key- no buzzer...nothing @ all. Took out the engine side harness plug & there is only 3 volts coming to what I believe is the Ignition Wire...What am I missing here? The battery is old but when I was checking the connections & such again it was still giving a reading of 12V. The 1 fusible link in the harness looks good too as do the fuses. Thanks! First thought -- bad or missing ground wire from body/chassis to battery? 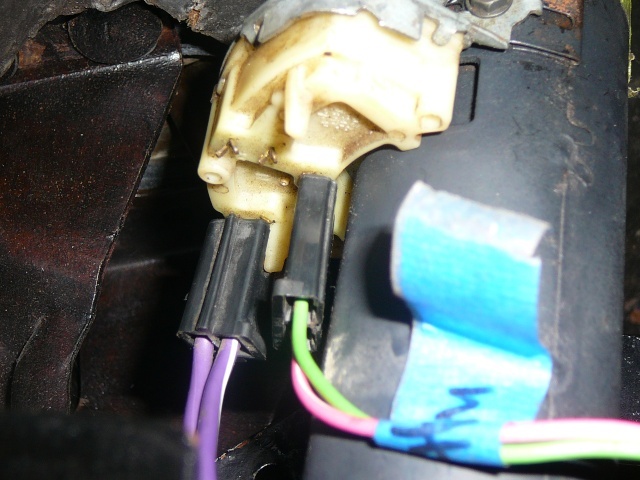 I remember running into the same problem with a 1st gen Monte a while back -- separate 12ga ground wire from battery to chassis was disconnected. This could be what you're seeing -- the 3V you're getting is just the amount finding its way back to the battery via other routes. Part of the trick in testing electrical is realizing that the problem might not be between the batt + and your meter, it could just as likely be between the meter and batt -. While I'm thinking of it, try this: run a long wire directly from batt - to where you are testing the ignition, and use that as the ground for your test. This way the juice has a direct path back to the battery. If it now reads 12V, your problem is on the ground side, not the + feed. Also try testing at the horn relay. IIRC, there is a direct path from batt + to the horn relay post, so a lack of voltage would again indicate a problem on the ground side. I'll check all the ground wires to be sure. (I bet you're correct). Excellent! The suspense was killing me. And I accept that title with all requisite humility. LOL- took a while cuz I haven't been back in the shop since I posted the question. After I reworked the ground wires- which I think were 16 or even 18 gauge- (plenty for the voltmeter to run off just not enough for the rest I guess)- I turned the key & heard the starter go! It was all of 2 seconds but one of the best sounds my ears have heard in a while! THANKS AGAIN! » Nylon Starter Gears and Truck batteries.